DP: How did you get involved in "Battleborn“, and can you tell us a bit about the project? Michel Gagné: In June 2013, I received an email from James Sanders who was the effects lead at Gearbox Software in Texas. James had been to one of my animation workshops a few years prior, and was wondering if I'd be interested in doing a similar one for his VFX crew at Gearbox. I told him that I'd love to do it and suggested that they bring me in for a week instead of a day. This way, I could do the workshop on the Monday and then, spend the rest of the week working on production with the crew to see how I could share some of my ideas in a more casual setting. After a few back and forth discussions, I was flown for an on-site meeting in September 2013. 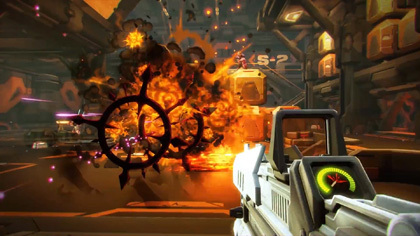 Once I got there, I was introduced to Gearbox's new IP, Battleborn , which actually didn't even have a real name at that point. The project was just starting and I saw a great opportunity to bring my kind of signature effects into the fold. Following my workshop on that Monday, I was given a work station in the middle of the VFX department and started brainstorming some ideas with James about how we could integrate hand drawn effects into Battleborn. Four days go by quickly, but in that short period we were able to create a couple of tests that showed the potential of such an endeavor. By the time I left, the whole crew was excited. For the next few months, I kept doing animation tests and concepts on a freelance basis to prove the viability of the premise. 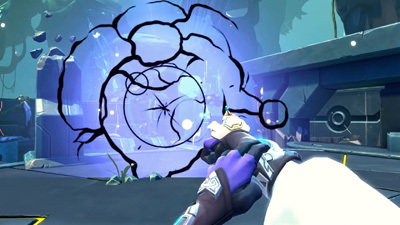 Within that time, I was also flown to Los Angeles for a couple of weeks to create the hand drawn effects featured in the Battleborn reveal trailer. As the weeks went by, I became more and more entrenched in the project. By January 2014, Gearbox hired Seung Kim to be my full time assistant. Since I was working mostly off site, it was important to have someone at the studio who could not only help me with inbetweens, but also build the flipbooks and act as my bridge to the pipeline. Right around that time, I was brought in to meet Seung and to help refine our pipeline. We figured out a lot of stuff in that two-week visit, but ultimately our techniques evolved through the whole production as we kept learning new tricks and progressed in our ability to resolve technical issues. Another thing that happened on that trip was Gearbox offering me to go on the project full time as VFX Director, which I enthusiastically agreed to. And this is how I spent the following two years of my life! I'd been working in games on and off since 2003, but I had yet to prove my mettle on a triple A title. 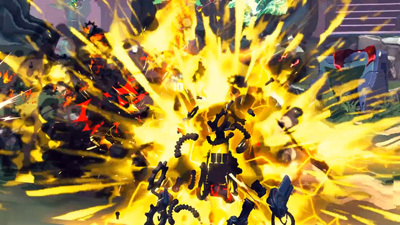 Battleborn not only offered me that opportunity but also allowed me to bring my signature effects style in a new ambitious way. DP: How big is the team for that game? Michel Gagné: At first, I worked closely with James Sanders whose technical knowledge of the game engine used by Gearbox was essential to the whole enterprise. Once we had a good pipeline figured out and my assistant, Seung Kim came on board, Nicholas Wilson was put in charge while James went to other projects. At this point, I started working closely with the other three members of the VFX crew, Gabe Simon, Ash Lyons and Mark Forsyth, who handled the implementation of my animation in the game. DP: And what was your job in the creation ? Michel Gagné: My responsibility as VFX Director was to design the esthetic, animate and do the final rendering of the 2D hand drawn animation assets. Although my duties were artistic, it was important for me to understand the technical aspects so that I could design and configure my work in the most optimal way possible. In game, you are always creating against a memory ceiling. Battleborn has so much 2D FX animation happening at all time, that we quickly ran into a big wall. This is where I applaud the Gearbox team for finding new creative ways to resolve these issues. Some very creative sleight of hand was performed to make this work. DP: Which tools did you use for that, and what do you generally use for 2D-Animation? Michel Gagné: My main arsenal of tools consists of Photoshop, Harmony, After Effects and Premiere. 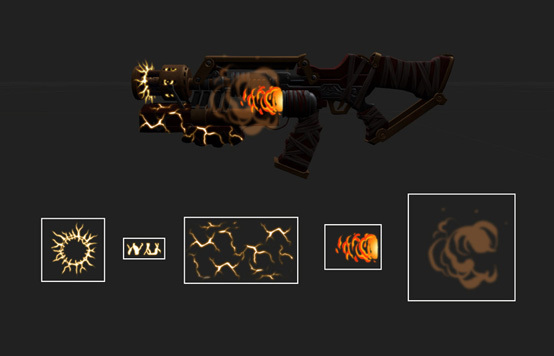 For Battleborn, I used Harmony for the animation, and Photoshop for doing my painted concepts. DP: Since you are an avid Harmony-User, could you tell us why you use it? Michel Gagné: Before jumping ship in 2012 to Harmony, I had been using software called Animo since 1992. After finishing Insanely Twisted Shadow Planet in 2011, I pretty much concluded that the time had come to start migrating away from Animo. Animo was software I actually helped develop, spending time in Cambridge, UK, working with the programming crew. In 1992, 2D digital ink and paint / compositing packages were just starting to emerge and companies were eager to team up with animators to help them move their software forward. I had a short film, Prelude to Eden, already animated but I needed a way to get it finished in color so this is when I teamed up with Cambridge Animation and entered the digital age. I used Animo on several movies afterward, including The Iron Giant, Osmosis Jones and Pixar's Ratatouille. Eventually, Cambridge Animation went out of business ending support and upgrades. I used the software for another year or two after their demise but eventually knew I had to make a switch. This is when I turned my attention to Toon Boom, a series of 2D animation software that were receiving a lot of praise from members of the animation community at the time. I downloaded the trial version of Toon Boom Animate Pro and it didn't take long to make me a convert. For me, software has to be sufficiently intuitive so that I can proceed without tutorials or reading a manual. I have a trial and error approach that lets me discover software at my pace and on my terms. If I can't make sense of it, I quickly lose interest. I'm sure my experience with Animo and Cambridge Animation facilitated my approach to Harmony, both software having a similar interface architecture, but still, intuitiveness is very important to me. Harmony keeps me curious and inquisitive. There is much depth to the software, so much to explore. DP: What are the Hardware-Requirements for doing a decent Animation in Harmony? Michel Gagné: Well, I always work on pretty high end PCs so I've never had any issues as far as requirements. Someone at Toon Boom might be better suited to answer that question. 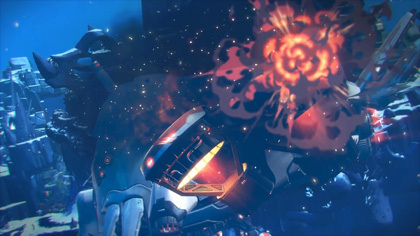 Michel Gagné: It varies from project to project, but for the creation of Battleborn's VFX, it sat right at the top of the effects creation. First, I would get some video footage from the game with the particular character I was working on, along with a document featuring the list of his/her abilities. At that point, I'd have a little discussion with the particular VFX artist that would be assigned to work with me on that character. Sometimes I would send concepts to make sure we were all on the same page. Once we all agreed on a direction, I'd fire up Harmony and start animating the effects components required. Sometimes, to help the team understand what I wanted, I'd import the game play footage into Harmony and do a mock-up comp with the FX, so that they could get a clear picture of what my vision was. 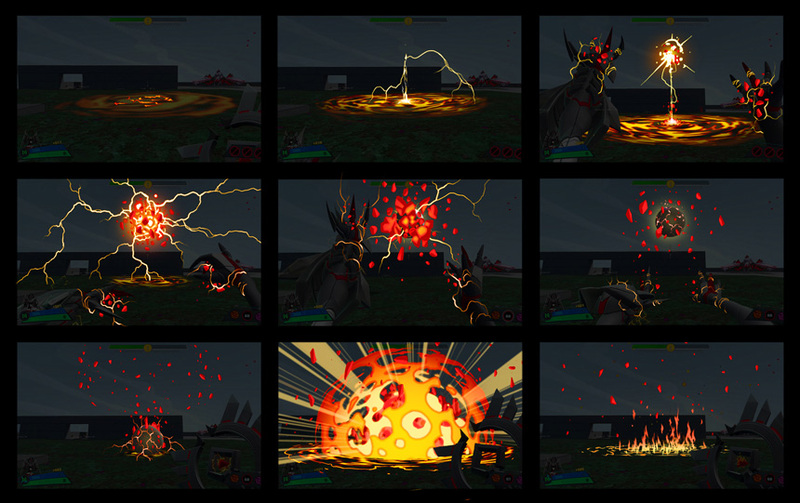 Each character's VFX was a team effort with me creating the hand drawn animation, Seung prepping the files, and a VFX artist implementing my animation in the game. 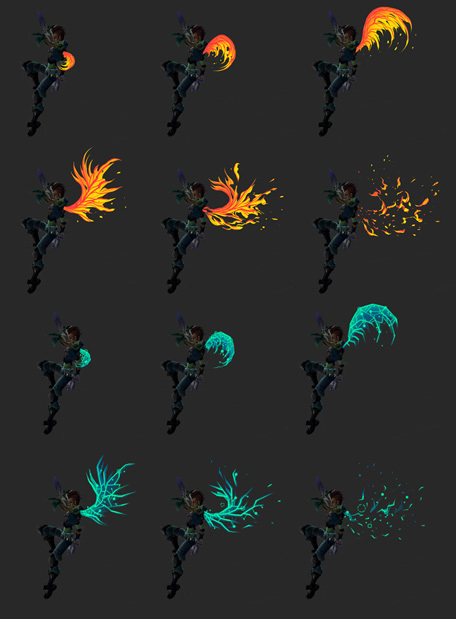 Once, those assets are introduced in the game engine, the VFX artists added geometry, particle bits and PhysX to better integrated the 2D animation in the 3D environment. Remember that everything I did on Battleborn is a cheat. I'm doing 2D FX Animation in a 3D world. How do we sell that to the audience? This is where I relied on the expertise of the Gearbox team to make the illusion as convincing as possible. DP: What connections did you have with your Harmony-Pipeline into the Game engine for Battleborn? Could you do Realtime-Previs? Michel Gagné: Once the frames are rendered and introduced in the game, you can start viewing the asset in motion right away and experiment with it at your heart's content, all in real-time. DP: When animating assets in Harmony, what is your workflow? Michel Gagné: As mentioned before, sometimes I'd paint concepts in Photoshop and shared them with the team before committing to animation. Other times, I'd do all the concepts in my head and then jump right into the animation. If an asset was 9 to 16 frames, I usually did all the drawings myself. For longer assets such as 25, 36 or more frames, I did the keys frames (on ones, twos or fours) and my assistant, Seung Kim, filled in the blank. Once that part of the animation was done, I composited the effect, by painting it and adding filters. My goal here was to get the effect to be as close as I could to its final look before it even entered the game. Colours could always be tweaked once in the engine, but for my part, I wanted to deliver as much of a turn key asset as I possibly could. 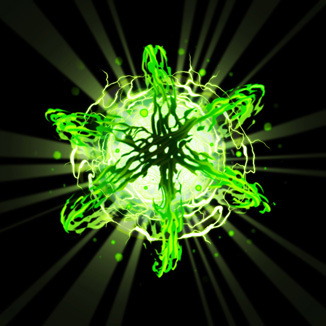 My work with Harmony was done for a particular effect once all the images of the sequence were rendered as a set of PNG4. 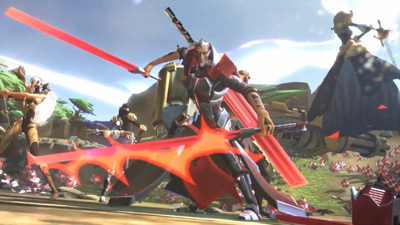 From that point, the images were assembled in Photoshop using a special script and then, the resulting flipbooks were introduced in the game engine. DP: Do you maybe have any tips for Harmony-Beginners, who are switching from other software-environments? Michel Gagné: Do as I did. Download the trial and experiment with it. See if this is something that will suit you and your project. DP: Can you recommend resources (Tutorials, Books, DVDs, Blogs) for anyone interested in learning to use Harmony? Michel Gagné: As I mentioned to you before, I'm more of a trial and error kind of guy. Whenever I get stuck I just go on Google and do a search to resolve my issue. So I guess my recommendation for resources would be to "Google it"! DP: And, from your perspective as a 2D-Artists working in the 3D-World of Games: What’s in store for that particular style in the next few years? Michel Gagné: We'll have to wait and see how people react to Battleborn. This is a new approach to 3D Game VFX. I mean flipbooks have been around in the past but never to that extent. 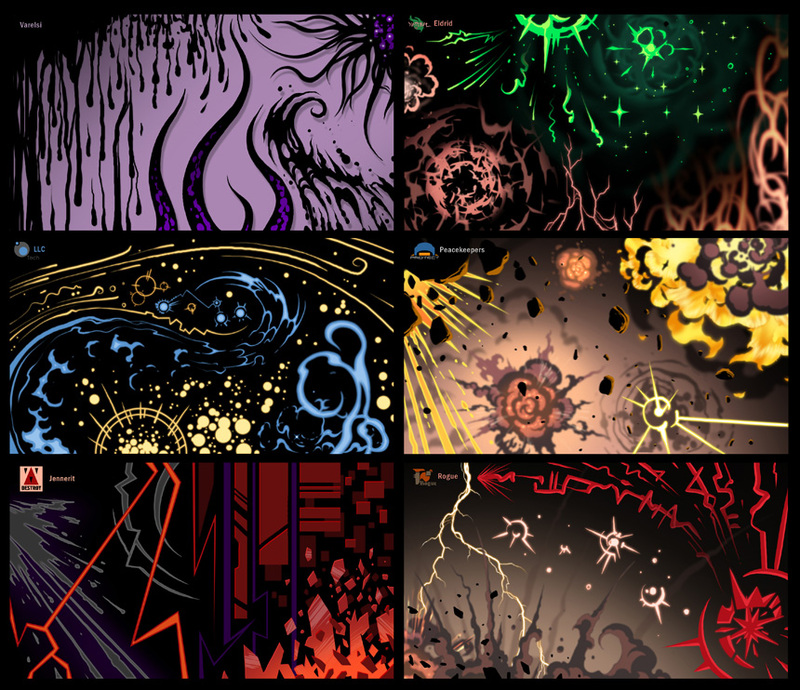 I did well over ten thousand images for Battleborn. There's so much variety in the effects. I hope people will dig it. For some, it might be a bit jarring from what they are used to, but I hope they will give a chance to the depth and imagination that went into creating those effects. I'd be thrilled to see this trend continue. Perhaps a new way to look at game FX?